Do this once and you have a glimpse how you will hate it forever. 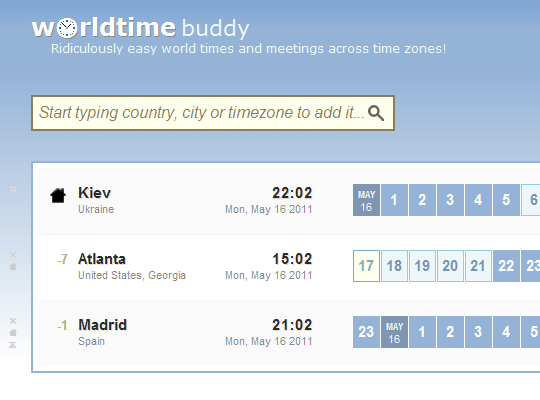 WorldTimeBuddy is countless take on simple time zone comparison and for my taste it gets most aspects right. Most of the site is home page that shows current day, time and what it corresponds to in other time zones. Site tries to guess time zone you are in automagically and you can add more by using search box. Searches are tied to geography (countries, cities) rather than time zone names (some do seem to be supported) or arbitrary offsets. App is very visual and time is nicely color-coded in traditional night/working/in-between hours. You can select an hour (or span of hours) for current day or arbitrary date and jump to separate event page for it. That will list chosen time zones and chosen time span (rather than whole day). Both home screen and event screen keep track of selection by URL parameters, which makes any and all choices very easy to share. Time zones can be sorted by drag and drop, but I find it weird that top one always assumes role of home timezone. As for me it would be logical if time zones could be sorted by offset. That would be more visual, but require that home zone could be somewhere in the middle of the list. Focus on geography is a little too strong. There is no way to add time zone via offset alone, so you need to ask for actual location instead of less personal “what time is it there at moment?” or “how far are you from GMT?”. Easy to use, great and simple links to share, but feels a little rigid in some places.